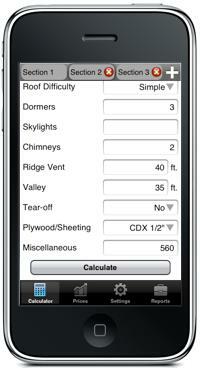 We are pleased to announce that our already popular Roofing Calculator PRO app, that is available for iPhone / iPad (now with Native iPad support) and Android, is updated to version 2.0. 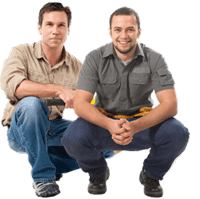 It includes MANY new and exciting features, that will help you Estimate ANY Roof even faster and more accurately. You have spoken and we have listened – based on YOUR comments here on our website and those in App Store / Android Play Store, we added ALL the things you’ve asked about, and MANY more! GPS Location to get and Record Job Address! Save and Modify Calculation Results! 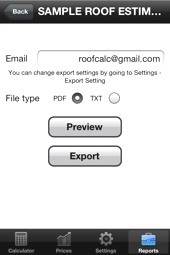 Results Exporting as PDF / Plain Text for Your Records or as a Formal Roof Proposal! Your Company Info, that will appear on the Letterhead of your Exports! Miscellaneous Costs (Permits / Dumpsters / Equipment, etc) and Sales Tax! More Intuitive App Navigation – All Features are listed as logical groups! Native support for iPad 10″ screen! In Version 1, you could calculate only 1 roof at a time. While this worked for most estimates, there are always houses with very cut-up roofs, or multiple buildings on the property, that need to be re-roofed. Now, you can have as many as 10 roofs or sections in one calculation. All results are combined to give you an overall snapshot of all costs and sizes, and broken down into detailed materials, prices and sizes list for each section! In version 1, we were also missing the ability to calculate a valley – a common feature on many roofs. One of the reasons it was not added to the initial release, was the fact that we were not sure how you wanted it, and how we could implement it, so it does not confuse you, when estimating a roof. The way it’s done now – there is a set cost per 1 linear foot of valley (valley labor cost), and it also automatically adds Ice & Water Shield (I&W) to the Underlayment section in the results. For valley length between 1 and 60 feet, we add 1 roll of I&W. For valley longer than 60 feet, additional rollas are added, is steps of 60 feet. Optional: We are considering adding 3 sq. ft. of roof shingles for every foot of valley – let us know how you feel about it – should it be done as part of the valley calculation, or go into the roof waste factor? Please voice your opinion in the comments section below. Now you can set a specific price for EACH dormer, and just enter the number of dormers on the roof. We figure that dormers do not take extra shingles (maybe 20-30 sq. ft. of shingle more than if a dormer was not there), but take a long time to work around. Between doing roof to wall flashing, and doing a valley at the top of a typical gable or hip dormer, you can spend a few hours on each dormer easily. 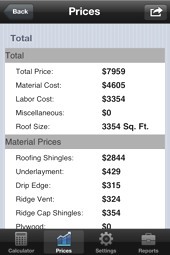 So just figure out your cost or price for each dormer, and it will be calculated as Labor Cost. Although this is already implemented in the Roofing Materials Section, there are charges that cannot be tied to material prices, and pertain to the job as a whole. Examples are Building Permits, Dumpsters / Disposal Fees, Equipment Rental, etc. You can add these MISC costs on the main calculator screen. Is it April 15th again? No – but you still need to pay the “dreaded” taxes on the materials you buy (unless you are doing a tax-exempt job). In the general Roof Settings, you can now enter your state’s sales tax (even with decimal points for states such as MA, where sales tax is 6.25%). Sales tax will be automatically added to the materials cost. You can now also save your calculation results, email them to yourself for your own records, or send it to your customer as a formal proposal / estimate! This Results Export option is available in PDF and plain text format. 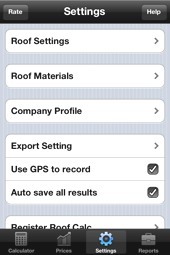 With the addition of GPS Positioning / Location, the address of your roof estimate is auto recorded when you click the “Calculate” button, and is saved with the results. You can always change the address, phone number, add Notes (such as details about the project, materials, customer, etc.). You can even open an “old” saved report, and go back to modify your calculations without typing in the setting you used. This could be useful if, for example, you did the estimate many months ago, but the materials prices have changed, or the customer wants to use a different type of roofing shingles. 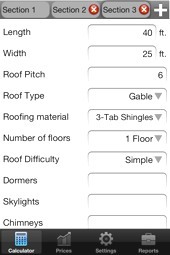 With Modify option, you will not need to remeasure the roof, or type in individual details for each section – all your options are saved and ready for your use! 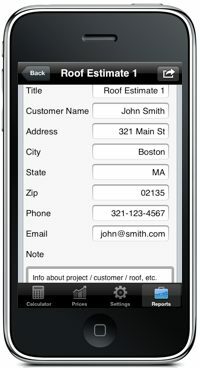 In this section, you can enter information about your roofing company, such as Name, Address, Phone #, Website / Email, and Construction License #. This information will appear on the Letterhead of your Exports and Proposal to the client, to make the proposal look official and presentable. You can also register your copy of Roofing Calculator App – if you do, we will be able to send you updates/news about our app, and about new apps and services that will be useful to you. We pledge not to send you spam, or “regular news letters” or sell your information to a 3rd party. This is only for our records and so we can communicate with you and know who our customers are. We are going to send you a thank-you gift for buying our app – a high-quality T-Shirt with a funny Roofing Calculator design on it. We are working on the design now, and will take your suggestions! The iPhone version is undergoing App Store review process (as of July 12, 2012) and should appear in the App Store within a couple of days. The Android version will be available within a week, as we are finishing final tests and bug-tracking. Thank you for purchasing our app!